This month featuring new collectible discoveries, letters, my review of The Haunted Fort and more! There will be a new production of the Tim Cope & Paul Boesing Hardy Boys musical The Secret of the Old Queen in San Francisco. Presented by Kaliyuga Arts, reviews will begin at the New Conservatory Theatre Center on June 1 and officially opens June 10, running Thursdays-Sundays until July 16. This play was a hit during it's Chicago run and a review of that production may be found in The Bayport TimesIssue 18. I've just added many new books & collectibles to my SALES PAGE . 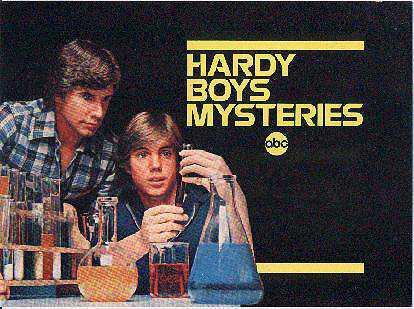 Promotional Poster - From ABC network promoting the 70's series. Casefile Gift Set - Yet another variant using the cover art from Casefile #1. Why this was done, I have no idea but in a future edition of The Bayport Times, I'll be examining Masked Monkey and the revised Flickering Torch. Meanwhile, if anyone can shed some light on the mystery, e-mail me and I'll print it in the next issue. Special thanks to Bob Nelson for bringing this to my attention. Synopsis: A long-distance telephone call from Chet Morton's uncle summons Frank and Joe Hardy and their staunch pal Chet to a summer art school, located near old Fort Senandadga which is reputed to be inhabited by a ghost. 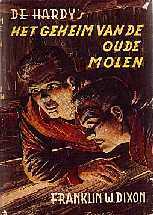 The young detectives assignment: recover two famous oil paintings stolen from the valuable Prisoner-Painter collection owned by Jefferson Davenport. Mr. Davenport, millionaire sponsor of the Millwood Art School, reveals that one of the famous Fort Senandaga pictures painted by his artist ancestor, General Jason Davenport, contains a clue to the hiding place of a priceless chain of gold. Vicious threats and deadly traps beset Frank, Joe and Chet as they search for clues to the stolen paintings and the gold treasure--a search that is complicated by a stormy fued between a proud Englishman and an equally proud Frenchman over the military history of the ancient fort. NOTE: Contrary to my normal practice, the above was taken from the synopsis printed in the book. This story is so inane and poorly written that I just can't bring myself to recount it. Doing so could only bring up the shockingly traumatic recollection of reading it in the first place! Lord knows how many unwitting Hardy fans have been driven to the brink of insanity by this story. The horror, the horror! Comments: This story originally appeared a couple of years after I had given up reading the Hardy Boys for more typical teenage pursuits. At the time, I little realized just how lucky I was! 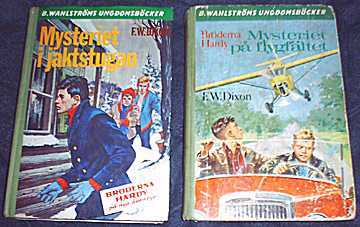 The mid-60's was a low point for the Hardys and this story (along with The Secret Agent On Flight 101) represents the series' nadir. It's almost as if the Syndicate was deliberately trying to destroy the series. There are just too many characters running around in this book and the author doesn't know how to handle them very well (actually, not at all!). The characters rush to and fro in a purposeless frenzy, there are numerous pointless scenes and many acts of senseless violence. Even in the few rare scenes that do somehow contribute to the plot, it's clear the author simply does not know how to write. Really, he doesn't have a clue! His ham-handed approach to exposition and characterization and his apparent tin ear to dialog is laughably bad. 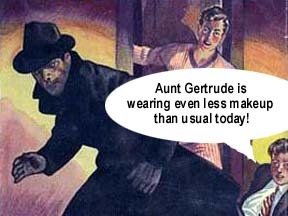 It's clear who the culprit is early into the book, despite the antics of obvious red herring, Ronnie Rush. There is more suspense in wondering if the sun will rise in the morning than there is in this entire story. Although the basic premise of the story (lost treasure in old fort/clue in painting) is a pretty good one (and frankly, the only halfway decent thing in this whole abortion), the execution is abysmal. Furthermore, the idea of the treasure being a gigantic solid gold chain is simply ludicrous. In the first place, what type of imbecile would make such a thing during a war then haul it up to the middle of nowhere and hide it? The treasure could just as easily have been a far more sensible cache of gold coins or bullion. Can anyone tell me why a Civil War prisoner would be held captive in an upstate New York pre-Revolutionary fort? And why would he be allowed almost free run of the place? Why, despite the fact that everyone knows his name, is he invariably referred to as "the Prisoner-Painter"? Stupid, Stupid, Stupid with a capital "S"! Some of the scenes are so absurdly idiotic that they border on the surreal. Can anyone imagine a full grown man being so terrified of a rubber sea serpent that he would jump out of his boat? Or that anyone would seal a boy in a steel drum, throw him in the middle of a lake and NOT expect him to die? Or how about Frank and Joe being completely conversant in the esoteric terms used to describe the various parts of an 18th century fort? Then there's Chet winning an art contest with a painting he's forced to revamp at the last minute after a vandal smears paint on it! Furthermore, if I never hear or read the word bateau again, it will be bateau goldarn soon for me! If this story were to made into a movie, only the demented directorial talents of the immortal Ed Wood Jr. (who made Plan 9 From Outer Space, Glen Or Glenda and countless other grade Z epics) would be able to do justice to it's complete imbecilic lunacy. Fortunately for all concerned, Ed is dead, so the chances of this horror reaching the silver screen are thankfully nil. According to the archives in the NY Public Library, this story was heavily edited by the staff at the Syndicate. This is hardly surprising, since author David Grambs clearly is unfit to write even a coherent grocery list! 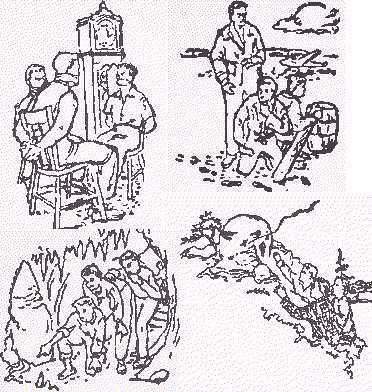 Grambs first work on the Hardy's was his abominable revision of The Shore Road Mystery in 1964 and he continued to display his startling ineptitude in his revisions of Footprints Under The Window in 1965, The Secret Of Skull Mountain in 1966, finally culminating in the odious The Secret Of The Lost Tunnel in 1968. At that point, apparently someone at the Syndicate came out of a coma long enough to realize that Grambs was either an idiot, apathetic or incompetent (or maybe all three) and informed him that his services would no longer be required. The rumour that the Syndicate sued him for taking money under false pretenses is undoubtedly false but they certainly would have been well within their rights in doing so. 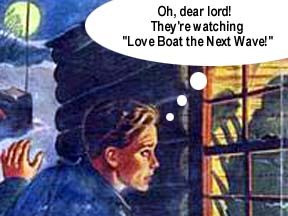 His work on the series is so atrocious that I've often wondered if English was Grambs' primary (or even secondary) language or if he was somehow related to the Stratemeyer family. Enough! It would be child's play to go on skewering all the idiotic things that occur in this story or to continue lambasting the author's total incompetence but why go on beating this poor, dead horse? Suffice it to say that this story ranks among the worst in the Hardy canon, surpassed only by the unreadable and totally meritless The Secret Agent On Flight 101 (which, by the way, will NEVER be reviewed here!). Suitable only for masochists, long-suffering reviewers or diehard Hardy fans who have read every other story (twice)! Test Your Cover Art IQ! Can you match the cover art description to the story? 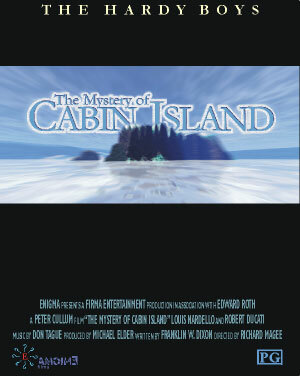 Well, I've been working on the Mystery of Cabin Island Movie stuff and it's starting to come together. Here's an image of the one sheet poster. The fictional production company is "Enigma Films". The actual ad is itself is some time away. I'll post more artwork as I make it. 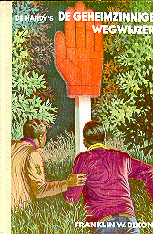 As always the credit line is: Peter Cullum, Hardy Boys Cabin Island Poster 1, 2000. In 1966, when I was 9 years old, my brother bought me a copy of The Missing Chums. I was hooked. For the next two years I purchased every volume up through The Haunted Fort (or whatever the actual title was). These were the blue spine volumes, although some of the stories (The Mark on the Door, What Happened at Midnight) had not yet been updated for 60's sensibilities. As the years passed I tucked the books away, recently giving them to my 9 year old nephew. 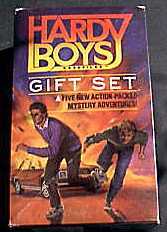 While browsing on eBay I saw Hardy Boys books for sale - the old ones with the highly colorful dust jackets. A wave of nostalgia settled over me and I have now purchased some 10 titles. I read them with guilty pleasure now, as I can remember still the 9 year old boy who loved those books. That, I think, is the true charm of the books. Still in the ORIGINAL BOX!!!!! Good condition - Box has wear and there is corner wear on the amp. This hard to find collectible is rare with original box! Note: Image is not of actual item and is for illustration purposes only.